Cities want to use such data to manage transportation options and make public policy decisions. The company that provided your scooter will collect detailed, anonymized data about your trip, from the moment you unlocked the vehicle right up until you left it. And that data will belong to the city. Mobility Data Services is used with dockless vehicles , but the system is intended to help cities also manage ride-hailing, car-sharing, autonomous vehicles and drones. It’s all powered by the data from individual vehicles. Transportation officials are thrilled about MDS’s potential to help handle new mobility technologies, but privacy advocates—and Uber—want to stop it dead in its tracks. Imagine you’re in Los Angeles, zipping to your next meeting on one of the thousands of dockless scooters available on city streets. You arrive at your destination, park the vehicle, and go on your way. While you do all of this, however, the company that provided your scooter will collect detailed, anonymized data about your trip, from the moment you unlocked the vehicle right up until you left it. And that data will soon belong to the city of Los Angeles. The Los Angeles Department of Transportation gets this kind of information through a groundbreaking digital tool it recently developed for all kinds of vehicles called the Mobility Data Specification, or MDS, which furnishes the city with information it has never before possessed. Patterns of movement derived from MDS can shape policy decisions, like where to put a protected bike lane or how to ensure low-income residents have access to dockless vehicles. 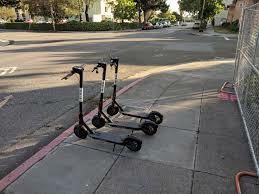 But the agency can also use MDS to send instructions back to the mobility companies—so that, for instance, the city could warn Bird if you parked your scooter illegally. Transportation officials are thrilled about MDS’s potential, but privacy advocates and Uber want to stop it dead in its tracks. For now, MDS is mainly being used with dockless vehicles like scooters and electric bikes, but the system is intended to help cities also manage ride-hailing, car-sharing, and even autonomous vehicles and drones. In just half a year, MDS has already spread from Los Angeles to Seattle and Providence. And it’s all powered by the data coming from individual vehicles, just like that scooter you used to get to your meeting. Transportation officials are thrilled about MDS’s potential to help them handle new mobility technologies, but privacy advocates—and Uber—want to stop it dead in its tracks. Whether the system should be hailed as a breakthrough for transportation policy or shunned as a massive invasion of privacy is quickly becoming one of the most heated controversies in urban policy. MDS is the brainchild of Seleta Reynolds, the Los Angeles Department of Transportation’s general manager, whom Mayor Eric Garcetti hired to lead the agency in 2014. Reynolds came to L.A. from San Francisco, where she was an executive at the Municipal Transportation Agency at a time when ride-hailing—led by Uber and Lyft—was exploding in popularity. The headaches of that experience were formative. “As ride-hail took off, it felt like there were a lot of things changing in the city that were invisible [to me] because companies’ information was opaque,” Reynolds says. “They had prevented cities from getting even basic data or having a regulatory posture.” Without access to ride-hail trip data, it was very difficult for a city to understand the new technology’s impact on transit, bike ridership, or taxis—and adjust policy accordingly. “The city was losing the ability to manage, design, and understand what was happening in the public realm,” she says. It was difficult for a city to understand ride-hailing’s impact on transit, bike ridership, or taxis—and adjust policy accordingly. Reynolds’ frustrations are familiar to transportation bureaucrats across the country who have fought with Uber and Lyft to share ride information. A few cities like Seattle and New York eventually used legal channels to access trip data, but ride-hailing companies sometimes appealed to state officials to pre-empt local efforts, often successfully. Reynolds arrived in Los Angeles determined to avoid being rolled again by mobility companies, and she saw technology as the key. Seeking to understand companies’ perspective, Reynolds joined the board of the Los Angeles Auto Show. There she met John Ellis, a former chief technologist at Ford. Reynolds soon hired his company, Ellis & Associates, to shape her agency’s approach to technology, a role it maintains today. In June 2018, a strategic plan written by Ellis & Associates hinted at the dramatic steps LADOT was about to take. It called for the agency to “standardize how data is processed into information and how that information can be converted into actions”—the ideas that would give rise to MDS—and included a lengthy dive into the culture around technology evolution. “Some will embrace this change with vigor and passion, only later to be disillusioned by a reality they didn’t expect,” the report reads. “Many will go through the stages of grief as they confront the loss of a world they didn’t want to see go away, struggling to see the benefit of the new world in its place.” That left more than a few transportation professionals scratching their heads. Behind the scenes, Ellis’ team was working with LADOT staff to create the application programming interfaces, or APIs, that would form the backbone of MDS. At the time, Reynolds assumed that the development of MDS would take place over several years. But then something unexpected happened: Dockless scooters exploded in popularity in neighboring Santa Monica in September 2017, and two months later LimeBike went directly to Los Angeles Councilmember Joe Buscaino—not LADOT—to negotiate the city’s first dockless bike-share deployment. It was then that LADOT’s efforts to build MDS went into overdrive. “When bikes and scooters showed up, they gave us a pretty interesting sandbox to start experimenting,” Reynolds says. When LADOT started crafting MDS in the summer of 2018, cities elsewhere were using a hodgepodge of data tools to track dockless vehicles on their streets. Local officials required that dockless vehicle companies submit information in PDF, CSV, or other formats. That wasn’t a good situation for the companies scrambling to fulfill each city’s unique requests, or for the cities struggling to share best practices. MDS was intended to be a way to standardize data collection for companies while ensuring cities had the information, capacity, and power to actively manage vehicle deployments. Throughout the MDS development process, LADOT provided regular updates on its GitHub page, and the agency invited other cities’ programmers to join webinars along with representatives from dockless vehicle companies and data analytics firms. LADOT released the first version of MDS in May 2018—just six months after development began—and the first companies began using it in September 2018, when LADOT launched a limited dockless vehicle pilot. MDS consists of two APIs. The first, called Provider, enables mobility companies to send information about individual devices directly to the city. With Provider, LADOT automatically gains information about the start, end, and route of each dockless vehicle trip, accurate within a few hundred feet. The city also gains information about whether the vehicle is broken, out of power, or in the process of being “rebalanced” (that is, being moved to another part of the city). Trip route information is shared after a 24-hour delay, but all other data flows to the city in a matter of minutes or hours. MDS’s second API is called Agency. It enables a city to instantly send digital information and instructions directly to private mobility companies. It allows the city to alert companies to events like a crash or a parade, advising them that their riders should avoid those areas, and to notify companies of vehicles that are illegally parked. In theory, it could also allow cities to adjust pricing (like scooter fees) to incentivize mobility companies’ behavior. Imagine a city reducing the fee paid by a scooter company to the city if a ride originates in a low-income neighborhood, or increasing it if a trip goes through a construction zone. MDS’s Agency API makes that kind of active mobility management possible for the first time. MDS’s Provider API went live in September 2018, when LADOT began to allow scooters to operate on a limited basis. Approved dockless vehicle companies have until April 15 to show they are compliant with Agency as well. Reynolds can reel off a long list of policy problems that data collected from MDS can help her solve. An example: “I’ve built a bike lane, but MDS shows that people are deviating from it to use other routes. Why?” Information about scooter location could allow a city to monitor whether a dockless vehicle company is obeying limits on the size of its fleet, or if it’s trying to cheat by putting a few extra ones on the sidewalk. Vehicles that remain stationary for long periods of time can be flagged as being potentially broken. “The two places where we have the biggest problems around privacy are Egypt and Los Angeles,” Ensign says. There is a general consensus that if things do go wrong with mobility data privacy, they could go very, very wrong. Beyond misuses of data by law enforcement, nightmare scenarios include a hack by an external party or a bad actor within city government combining MDS data with other sources in order to stalk a victim. But Uber has something of a boy-who-cried-wolf problem when it cites privacy as reason to oppose MDS; ride-hailing companies have used the same claim for years when fighting city efforts to access even aggregated passenger trip information. (Lyft declined to comment for this article.) Proponents of MDS such as Remix, a transportation analytics contractor to LADOT, suggest that Uber’s call for privacy protection masks a self-interested desire to protect competitive insights, especially if its core ride-hailing business becomes subject to MDS—something Reynolds envisions. If things do go wrong with mobility data privacy, they could go very, very wrong. Responding to privacy questions, LADOT has issued MDS data-handling guidelines and principles listing protective steps the agency takes, such as limiting data accessibility through public records requests. The agency also makes clear that MDS only collects vehicle information; there is no identifier for the individual using that vehicle. But is that enough? A study in Nature concluded that data sets with time stamps of the kind collected through MDS can reveal a user’s identity with as few as four data points. A recent New York Times article explained how cellphone data can be deanonymized and used for purposes that individuals never intended or even knew about. And in the transportation world, researchers in 2014 were able to identify actor Bradley Cooper’s taxi trips from a data set released by the New York City Taxi and Limousine Commission. By collecting data on tens of thousands of daily trips—maybe more—MDS could magnify the risks of such scenarios. This month, LADOT announced that the latest version update of MDS would allow dockless vehicle companies to share vehicle trip data after a 24-hour delay instead of in real time, which had been a sticking point (according to Uber’s Ensign, “real-time data collection is basically surveillance”). Reynolds claims the move is intended to make MDS easier to implement, but the privacy pushback may have been a factor. In the meantime, MDS continues to gain traction both in Los Angeles and around the country. On March 22, LADOT announced that Bird, LimeBike, and Spin would be permitted to operate 22,500 dockless scooters across the city—with the requirement that they use both the Provider and Agency APIs by April 15. Cities including Seattle, San Jose, Austin, Santa Monica, Providence, and Louisville are now using MDS to collect data to manage their own dockless vehicles. The Civic Analytics Network, an alliance of city chief data officers, issued an open letter backing the adoption of MDS as a standard. Michael Schneurle, a data officer for Louisville, Kentucky, says LADOT staff helped his city use MDS after scooters appeared unexpectedly on local streets. Louisville eventually made aggregated MDS trip data available to the public—a step LADOT has not taken (though Reynolds says she would like to). “It was immediately among our four most popular data sets,” Schneurle says. Reynolds says that as MDS evolves, she wants to figure out what kind of nonprofit or technical advisory group is best suited to manage it—including adopting standards around privacy protection. “It cannot be LADOT,” she says. But with greater efforts around privacy, there is no guarantee that critics like Uber will let the MDS development process unfold unopposed. Ride-hailing companies have a history of asking state leaders to pre-empt local policies they don’t like. Uber’s Ensign implies that her company could revisit that playbook to fight MDS, saying “it will be interesting to see if MDS is compliant with the California Consumer Privacy Act”—referring to a bill passed in 2018 to protect Californians’ personal data that goes into effect next January. Even if California clamps down on MDS, many cities outside its borders have already adopted it. Without federal privacy legislation like Europe’s General Data Protection Regulation, it may be impossible to put the genie back in the bottle. Already, MDS has expanded to modes beyond scooters and bikes: Seattle is using it to collect data about LimePod, Lime’s car-sharing service. No city currently uses MDS to manage ride-hailing, but that could be a natural next step.